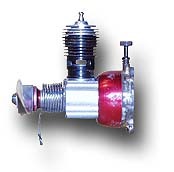 The Bee series forms the backbone of Cox engine production. The Babe Bee engine was the first mass produce engine using custom bar stock material for the crankcase. This design feature, invented by Cox engineer Bill Seltzer, eliminated many problems occurring during the machining of cast aluminum crankcases. As the crankcases could now be produced on automatic lathes and screw machines, costs were dramatically reduced, which lead to unbeatably low prices. All Bee engines are equipped with reed valve controlled inlets. For many years these reeds were made from a copper-beryllium alloy, in the 1980s this was replaced by a clear plastic material of similar or even better properties. One exception from the rule, the RR-1 with its rotary valve inlet system is included in this section, because it closely resembles the Bee engines. The Pee Wee looks like a small Babe Bee. 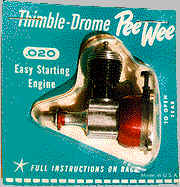 This more recent Pee Wee does not have the letters «Thimble Drome» engraved on the tank (after 1969). The sample also shows the typical screw driver marks on the red fuel tank in the vicinity of the mounting lugs. 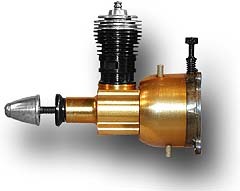 This engine with a silver fuel tank, was probably intended as a replacement engine for the «Mini-Stunt» or «Little Stinker» biplane C/L models. This is one of the last Pee Wee products. It came with an exhaust throttle ring which can be remotely controlled. The propeller drive washer was hex shaped to fit the plastic starter washer (not shown). The cast metal back plate has one filler tube only and a small vent hole. To maintain its low prices, Cox was always trying to reduce costs. A noticeable part of the production costs was the assembly of the engines. On the other hand, modelers are usually interested in building something of their own. Therefore Cox offered a Pee Wee .020 in kit form. Obviously sales were not up to expectations so that this idea was dropped after about 1 year. I am still looking for a Pee Wee .020 kit for my virtual museum. This is the classic Babe Bee engine. 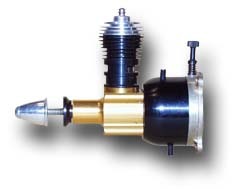 It was cheap and reliable and many modelers, like myself, collected their first experience with combustion engines with it. The spinner comes from a Tee Dee and has to be replaced by a simple washer, though. This is a current variant of the Babe Bee. It came with double slotted exhaust ports and a plastic back plate. 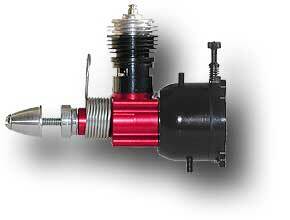 Also, it uses the new hex drive washer with a plastic disk for the spring starter which has been developed in 1986. The muffler ring was not part of the engine but added by the previous owner. This engine was the first engine which was sold complete as a muffled engine. These "Quiet Zone" engines were used in cars like the Corvette and planes like the PT-19 or the Stuka and it was also available as a separate engine. 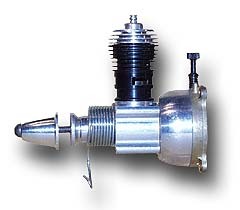 In order to reach almost the same performance as a standard Babe Bee, it used the twin ported cylinder #6. This also means that the sub induction principle was skipped to avoid induction of exhaust gas into the crankcase. In order to compensate the power loss due to the muffler, the engine was equipped with a Tee Dee glow head. 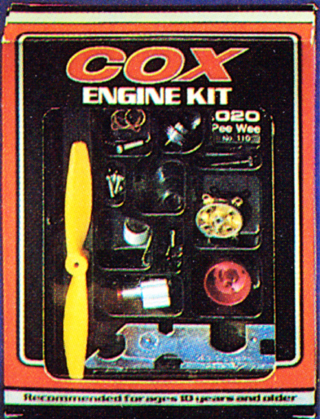 The design of Cox engines during these years was done by Bill Atwood and Dale Kirn. Similar to the QZ 049, it came with a muffler but featured a larger, red Golden Bee style tank. 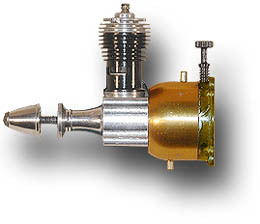 This early model came with a brass prop driver. Later versions (1990) occasionally came with a blue spinner and the older starter system without the plastic washer. Despite the name QRC it does not have an R/C exhaust throttle muffler. This engine is basically a Babe Bee engine with cross flow vents in the enlarged tank. 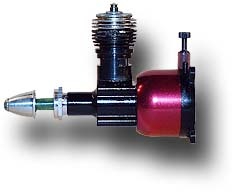 The larger tank made this engine attractive for R/C applications. The cylinders have one bypass port, a later version came with a throttle ring (#120-1) and had 2 bypass ports. 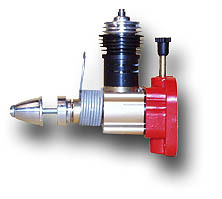 Due to the longer tank, the Golden Bee has a slightly larger Venturi diameter (4.37 versus 3.57 mm) at the reed valve. 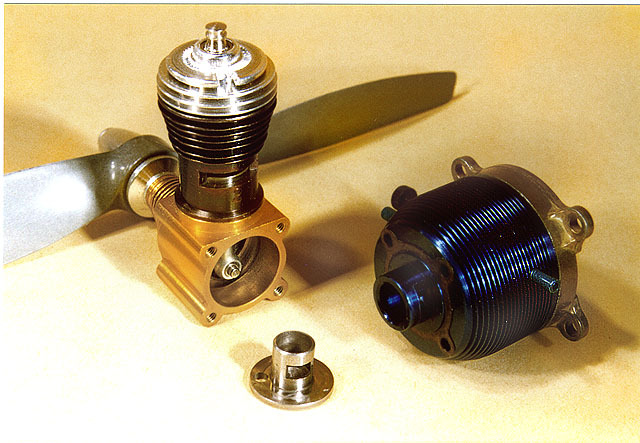 It was planned to manufacture the engine with a gold anodized tank and crankcase, but some runs of these engines have also been delivered with a black tank and others with a plain anodized crankcase and propeller drive plate (like the early sample shown on top). It depended on what parts were available, as anodizing was subcontracted and not done at Cox. Engines with the vented back plate also occur, but I am not sure whether these are mutations created by keen modelers or whether they left Santa Ana in this configuration. The engine was later replaced by the similar Black Widow (see below). A more powerful Golden Bee with a large 4 minute tank, which has vent tubes to simplify fuelling and to achieve constant fuel flow. Typically has a black crankcase and a black tank, although a lot of engines were also produced with a silver tank. The cylinder came with generous bypass flutes and extended port timing (that's what was written by the company - I did not yet check the data). Both engines shown already have the plastic back plate, older versions (before 1983) had the zinc alloy plate. 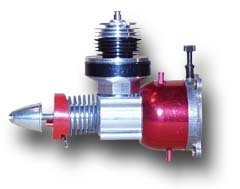 Early models came with a red rubber spinner, as used on many control line aircraft. This earlier Texaco engine has a large capacity tank, and came with a black anodized, shiny crankcase. These engines were the first with the lightweight plastic back plate, which was also cheaper to manufacture. Good engines run more than 5 minutes on one fuel tank. This engine is identical to the Standard Texaco, but has a smaller tank for ½-A short tank events. The hex prop drive washer was not used on later Texaco models. This more recent Texaco engine has double slotted exhaust ports and a high glow head providing more cooling fins. 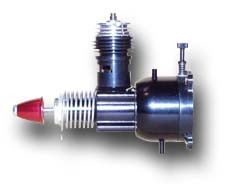 It can be used for Texaco R/C duration events. According to the advertising department, its venturi system has been improved so that it is able to swing a 7 x 3.5 prop. Compared to its predecessors, it now had a silver crankcase and the hex drive plate has been replaced by a thicker cylindrical one. 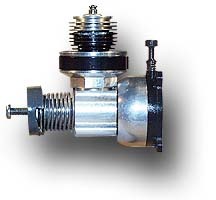 "Zero drag" spring starter. 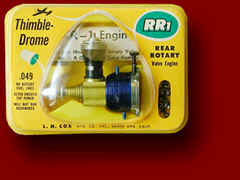 At first glance, the RR1 looks like a fancy Golden Bee with a blue anodized fuel tank. The disassembly reveals the twin bypass cylinder and the rear rotary valve intake, which was used instead of the reed valve, typical for the Bee type engines. As you can see on the photo, there was no spring starter. 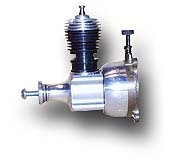 Production ended in 1965 and later engine designs reverted again to the simpler and cheaper reed valve induction system. 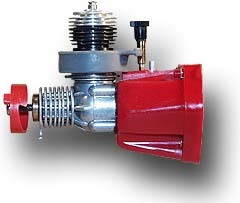 Rotary valve inlets were used again with the introduction of the Medallion and Tee-Dee series. During the first two years of production these engines came with a silver crankcase like the first sample shown (1957-1958). Later, the crankcase was anodized yellow which contrasts nicely with the dark blue tank. The very first production engines (probably during the first year?) had smooth crankcases and fuel tank without the small groves. 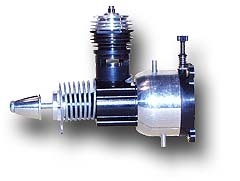 I am still looking for a sample of the smooth variant of the RR1 engine. Advertised as a high performance competition engine, this engine is also available with a displacement of .051 cubic inches. The cylinder has the double slotted exhaust ports of the Texaco and Babe Bee. The needle extension of this run of Killer Bees was made from a piece of plastic tube. This was lightweight, cheap and reduced vibration loads on the needle thread. Later versions of the engine (sold after 2002) under the same name do not have the performance features of the 1996 design. They are merely Babe Bee engines with an anodized crankcase. See also: Comparison 1996 versus 2002 model. The larger brother of the .049 Killer Bee came also without a mesh screen on the intake to improve performance. 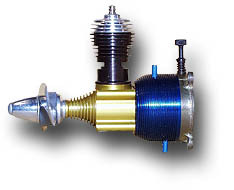 Both Killer Bees have the zero drag spring starter, which completely disengages to avoid friction losses. 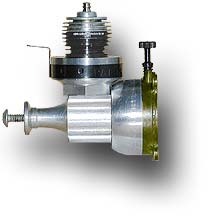 The two models differ in their cylinder/piston assembly and in the color of the back plate only. 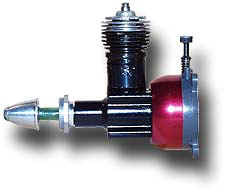 The Venom was the last and finest high performance engine development of the Bee type engines. It had been designed for control line rat racing events and featured some interesting details. 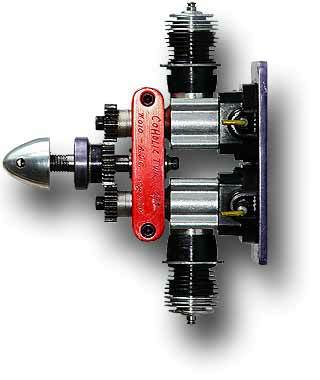 The crankshaft with cutouts for better balancing comes from the 1996 Killer Bee. 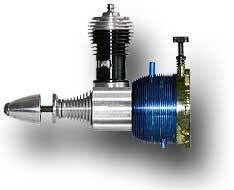 The lightweight piston has sub-induction and a reduced wall thickness which makes it somewhat fragile. When not run in properly, the piston top may come off. Therefore speed was limited to 22,000 r.p.m. on the ground. 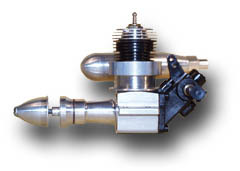 Additionally, a narrow boost flute was added to each transfer port of the cylinder to improve scavenging (similar to the Tee Dee cylinder). To literally top it off, a high compression glow head and a few head gaskets to play with the compression ratio were added. The Venom has been manufactured in a run of 1000 engines only, which is an unusually small number for a Cox engine. This engine resembles the later Dragonfly, but has an unusual cast crankcase. The red «clunker» tank is smaller than that of the Dragonfly and the muffler ring is completely covered by a soft rubber ring. 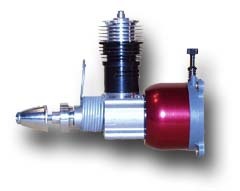 The complete muffler assembly can be rotated by an R/C servo for throttle control. The exhaust ports are double slotted and I assume, that these narrow slots together with the rubber lip did not really make the engine a top performer. Machining the cast crankcase proved to be difficult and expensive. For that reason later engine developments went back to the standard stock bar design. The Dragonfly features a huge "clunker" tank and an R/C controllable throttle/muffler ring similar to the R/C Bee which made it a good selection for small aerobatic models. The engine had to be mounted firmly against a firewall to keep the tank fuel tight, as the back plate was not attached to the engine itself. Power was between the Babe Bee and the Black Widow and its tank provided fuel for 6 minutes of running at full throttle. Another variant of this engine has a red tank and a rubber lip muffler like the R/C Bee. 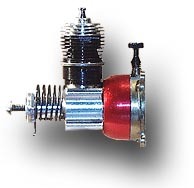 This reed valve engine with unusual displacement came with a huge, rear mounted R/C carburetor and the same muffler as the Tee Dee .09 RC. 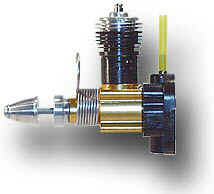 A conventional glow plug was installed. The power is similar to the Tee Dee .051 and maximum rotation speed with a 6 x 3 prop was about 17'500 1/min. Obviously being no big success, it vanished from the production line after a relatively short period of time. This twin was composed from two .049 Bees by well known engine builder Andrew Coholic. The engines are mounted on a massive aluminum back plate and clamped together at the necks of their crankcases. 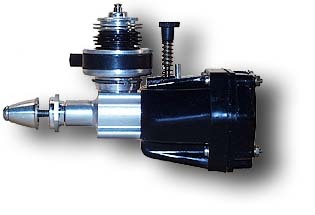 The main shaft runs in twin ball bearings and the gear ratio is approximately 0.82. Andrew is also responsible for a few other Cox modifications like the sideport Tee Dee and an ignition versions of the Sportsman.